Tsunami Warning Lifted After Earthquake Off Japan's Coast : The Two-Way The Japan Meteorological Agency says Tuesday's magnitude 7.4 quake triggered moderate tsunamis. Seven hours after the quake, all tsunami warnings and advisories were canceled. This map by the U.S. Geological Survey shows the epicenter of the quake, which hit Japan early Tuesday local time. 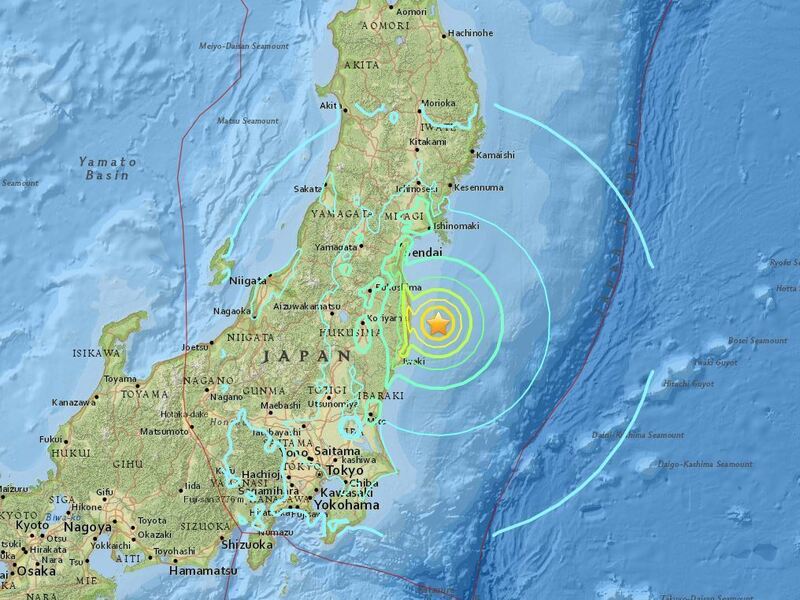 Officials in Japan have lifted tsunami warnings and advisories after a strong earthquake hit off the coast. A tsunami warning had been in effect along Japan's Fukushima coast after the magnitude 7.4 quake hit at 5:59 a.m. local time on Tuesday (3:59 p.m. EST Monday). The quake triggered moderate tsunamis but they did not cause major damage. The Japan Meteorological Agency says the earthquake was an aftershock to the magnitude 9.0 quake that hit in 2011 and caused a deadly tsunami in the same area. The earthquake and tsunami killed 18,000 people. After seven hours, the warnings and advisories were lifted, but the agency told residents to remain cautious — that another large quake could hit in the next few days. The meteorological agency had warned that waves as high as 9 feet are "expected to hit repeatedly." Fukushima residents should evacuate coastal areas immediately and move to higher ground, it said, and "damage due to tsunami waves is expected." This quake occurred about 75 miles southwest of the devastating 2011 Tohoku quake and is on a different fault line, a U.S. Geological Survey duty seismologist told NPR's Chris Joyce. The extent of the damage was not immediately clear. State broadcaster NHK said a fire erupted at a petrochemical complex and was quickly put out. Fukushima is home to the nuclear power plant damaged in 2011's quake and tsunami. The Tokyo Electric Power Co., which owns the plant, tweeted that it has found no abnormalities at its power stations. Japanese Prime Minister Shinzo Abe said the government was ready to respond. "I have ordered my government to immediately collect and provide information regarding tsunami evacuations and do everything to tackle the disaster," he told reporters in Buenos Aires. Abe is in Argentina following the APEC meeting in Peru. John Matthews in Tokyo says news reports in Japan are stressing the importance of evacuation orders. "Broadcasters repeatedly reminded listeners to remember the 2011 disaster, when residents of northeastern Japan returned to coastal areas too early and were swept away by tsunamis," he says.